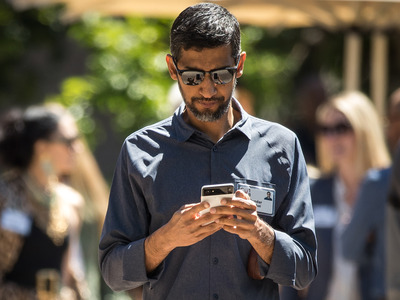 The study found that just under 90% of the apps analysed could send data to companies owned by Google’s parent company Alphabet. Companies like Google and Facebook can hoover up vast quantities of data from third-party apps on people’s smartphones, according to a detailed new study by the University of Oxford. Researchers analysed the code of 959,000 apps on the US and UK Google Play stores. It revealed how huge numbers of them are set up to transfer data to big tech companies. Information that could be shared via third-party apps could include things like age, gender, and location, according to The Financial Times, which first spotted the Oxford research. The study said the median app could transfer data to five tracker companies, which could then ultimately pass the data along to firms like Google. Certain app genres were more tracking-intensive than others. “In particular, news apps and apps targeted at children appear to be amongst the worst in terms of the number of third-party trackers associated with them,” the paper said. Apps targeted at children throw up some particularly thorny legal issues around data tracking, which the paper makes clear in its conclusion. “Some of the practices likely to be involved – such as allowing profiling of children without attempting to obtain parental consent – may be downright unlawful,” it said. “We disagree with the methodology and the findings of this study. It mischaracterises ordinary functional services like crash reporting and analytics, and how apps share data to deliver those services,” a spokesman said in a statement to Business Insider. Amazon and Twitter declined to comment. Facebook and Verizon did not immediately respond to Business Insider’s request for comment. “Third party tracking is the perfect example that shows how impossible it has become for any average user to fully understand what is happening to their data, let alone to opt-out or take control of their data.